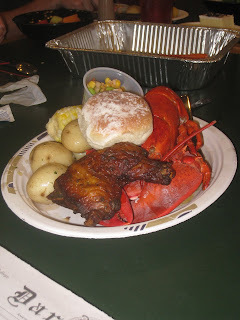 First year students were officially iniated into the wonderful world of DDS with the presentation of the Lobster Dinner, which features steamed Maine lobster, herbed yellow potatoes, corn on the cob, roasted chicken and a soy bean and sundried tomato salad. Why all the hype for this meal every year, when all it does is disappoint? Tradition, perhaps? Many first years complained about the overcooked and inedible lobster. Those who were vegetarians sat overlooking a measly slice of poorly presented cheese lasagna, while their table mates feasted on their bountiful losbster meal. And those whose pre-Dartmouth experience never exposed them to this type of delicacy sat cluelessy picking at the lobster. Certainly not a crowd pleaser. Perhaps the best part of the meal was the yellow sheet cake with vanilla buttercream icing served for dessert. There's just something wrong about having lobster served on a fake plate.